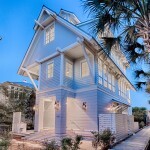 Rosemary Beach real estate listing are updated with the newest listings from all of 30A Area. Browse all that Rosemary Beach has to offer, and please feel free to register and save your searches in complete confidence of privacy. Rosemary Beach was created with convenience in mind; it was carefully and methodically planned with the intention of allowing residents to live, work, and relax all in the same place, where all the necessities of life are all within walking distance. Rosemary Beach shares many qualities with the nearby Seaside community, but is still somewhat unknown to visitors and hasn’t quite grown at the pace seen by some of its neighbors. We have listed Rosemary Beach homes for sale by price and amenities below. Rosemary Beach is located toward the eastern end of Highway 30A and was inspired by the “classic” Florida beach town— laid-back, easygoing, and carefree. Rosemary Beach real estate offers 107-acre community, named for the rosemary that grows among the sand dunes of the area, was established with the hopes of creating a living space where residents feel more like family than simply neighbors. Established in 1995, Rosemary Beach is slowly gaining popularity as a vacation spot for visitors, as seen by the addition of several residential areas and amenities near the community’s center. Rosemary Beach is the ideal setting for rest and relaxation. Whether your idea of relaxation is a day at the beach or enjoying all the outdoor activities that the area has to offer, Rosemary Beach has everything you’re looking for. One visit to Rosemary Beach and you’ll see why its residents, and even its visitors, take so much pride in maintaining this little piece of paradise. Visitors are first drawn to Rosemary Beach by its unique architecture—Dutch and West Indies-inspired homes in natural shades of rust, tan, olive green and brown. Just like its atmosphere, the eateries of Rosemary Beach are as carefree and unpretentious as its residents and visitors. While most are small cafes, coffee shops, and specialty markets, the restaurants of Rosemary Beach offer plenty of dine-in options for residents and visitors, as well as carry-out options for those wanting to picnic on the beach or among the many scenic nature areas of Rosemary Beach.